The pattern is called Temperance from Ravelry. 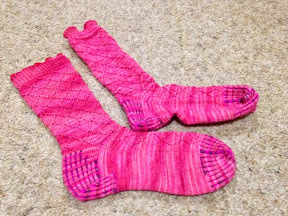 I've been working on a method of using two strands of yarn knitted separately (bit like mosaic knitting) to reinforce the heels and toes by using a scrap yarn. I'm hoping to improve the durability and longevity of socks.